My Favorite Swimsuits and Sunguards Are On Sale for 60% Off!! With all the boys in my house, we're rough on swimsuits . . . and I'm not a huge fan of the typical character suits. With sadness this week, I had to put my absolute favorite swimsuit (with matching sun guard) in my consignment pile. It's a 3T and my littlest one is wearing 5s now. I just couldn't stretch it to make it work any further. 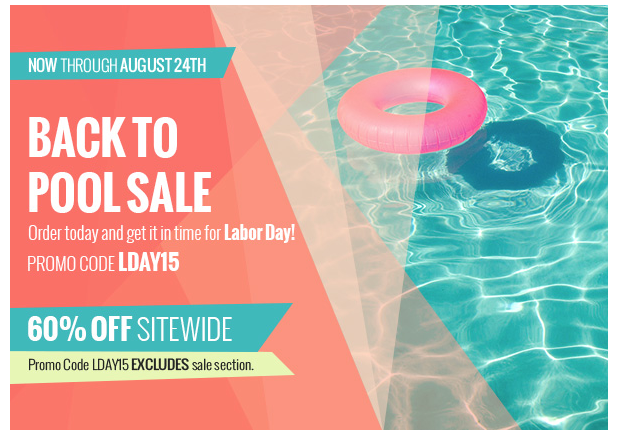 You can imagine how excited I was to find that the site they were purchased from - Cabana Life - which can be pretty expensive was having a 60% off sale with the code LDAY15! Hurry, it's ending soon but the suits are fun, bright and well made especially if you have fair-skinned littles. They also have girls, women's, coverups and more. Note shipping is $9.95 so not cheap but still a good value for what you are getting - and the code isn't good on items already on sale. Enjoy! Can't wait to see what you get.